Our website will provide you with an overview of the range of courses and examinations we offer as well as our specific services for universities, colleges, and institutions. You can also learn more about our customer advisory service and accommodation possibilities in Aachen. We look forward to hearing from you and will happily deal with any of your queries either in person, by telephone or via email. Attention: Due to bank holidays, Sprachenakademie will remain closed from April 19 until April 22. Our examination centre will remain closed from April 17 until April 23. … with leisure programme & European city trips! The results of the last DSH exam can be found here. 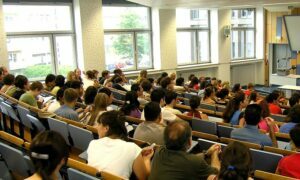 German classes for several target groups: Intensive courses for university preparation and for the job, integration courses, examination training and more. Language and university aptitude tests: DSH, TestDaF, telc exams, TOEFL, TOEIC, IELTS, TestAS and more. University cooperations, special offers for groups (university or job preparation), compact custommade programmes. The University of Applied Sciences Aachen (FH Aachen) entrusts Sprachenakademie with the duties of the university language centre. You can find more detailed information here. You are about to book a course at Sprachenakademie and look for a place to stay in Aachen? Our partner company preStep offers different types of accommodation.